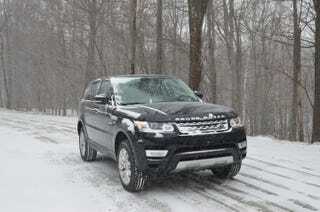 Range Rovers are dime-a-dozen in northeastern United States. People just can't seem to get enough of them; the status, the looks, and the comfort. Therefore when it came time to redesign the Range Rover and the Range Rover Sport, Land Rover had to be very careful about not changing them too much, while making them modern and improved in every way. I have sampled the big supercharged (V8) Range Rover in an off-road environment (part 1,2,3) and was impressed by what it could do right out of the box. Now I sampled the new Sport HSE with the new supercharged V6 on the highway and on snow covered secondary roads.